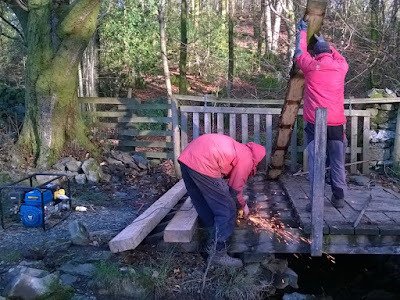 As part of our low-level winter work we've spent some time over in Windermere repairing a couple of wooden bridges at St. Catherine's. As you can see in the photograph above the bridges were in quite a poor state and had already undergone several temporary repairs but it was now time to give them a new lease of life. The first job was to remove the old treads, while taking off the treads many of the nails were left in the beams so we removed the tops with an angle grinder. Since the beams were in a decent condition they were left in place and the new Larch treads were nailed onto the old beams. The new bridges are not on a public right of way and will mostly be used for forestry and farming operations. 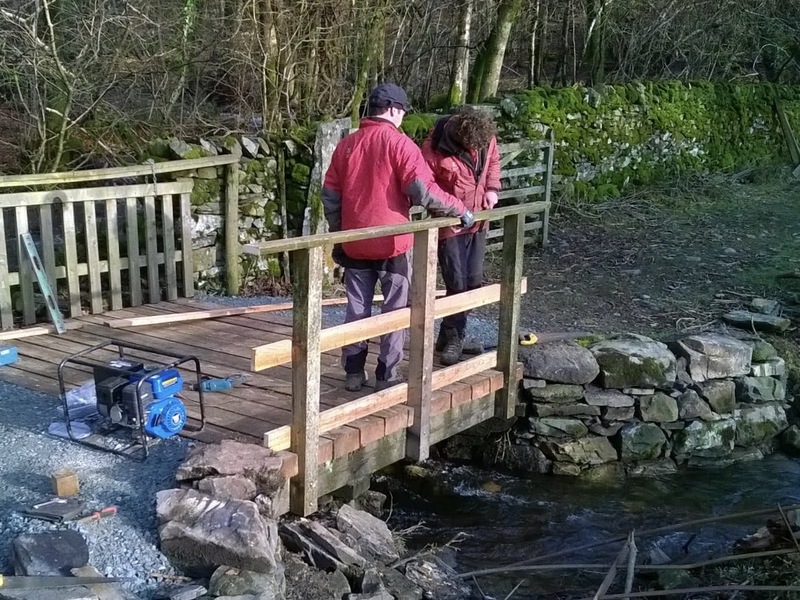 But since they are also used by people walking around the estate at St. Catherine's we made sure that the bridges were always passable removing only a few treads at a time and replacing them as we went along. 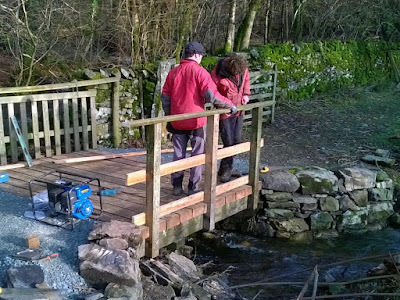 Once the treads were in position we trimmed them all off using a circular saw and tidied up the dry stone revetments either side of the bridge. This would allow us to gravel up to the bridge and remove the lip between path and bridge. Once the path had been gravelled up to the bridge a non-slip surface was attached to the bridge. A section of tread was removed to allow each of the uprights to sit flush against the outer beam so they could be bolted into place. The final job was to attach the handrails to the uprights. You can see a couple of before and after photos of the second bridge below. 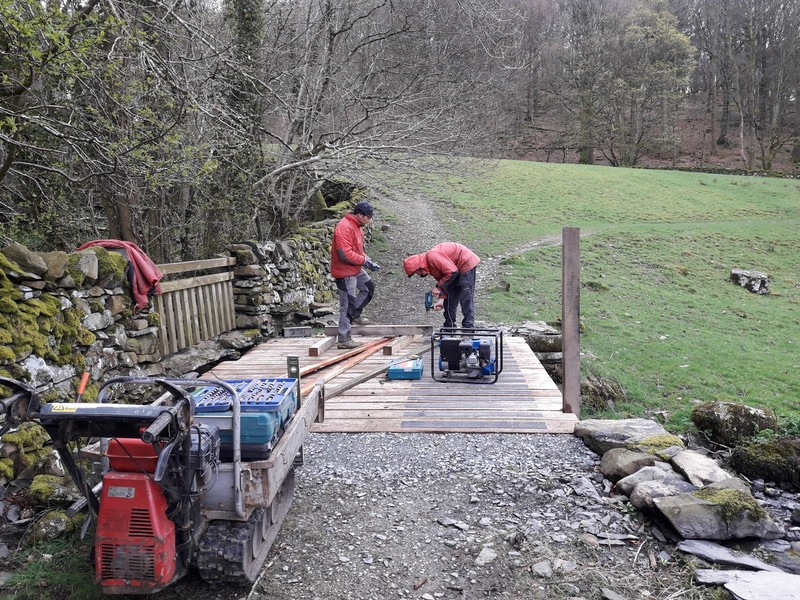 The repaired bridges, with new thicker treads, should now safely support any heavy vehicles passing over them as well as provide better access to anyone wandering around the estate. Over the last few weeks we've been working over at High Lickbarrow Farm in Windermere putting in around 400 metres of stock proof fencing. 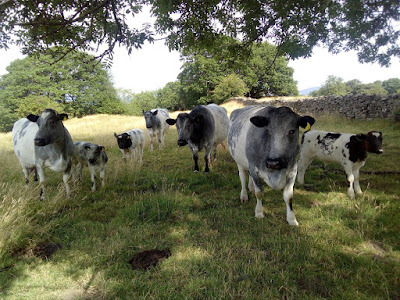 High Lickbarrow farm was bequeathed to the National Trust in 2015 and is home to the rare Albion cattle, formerly known as "Blue" Albions. The Albion has recently been recognised as a UK native rare breed and added to the Rare Breeds Survival Trust's watchlist because of its rarity. High Lickbarrow Farm supports the largest herd in the country. 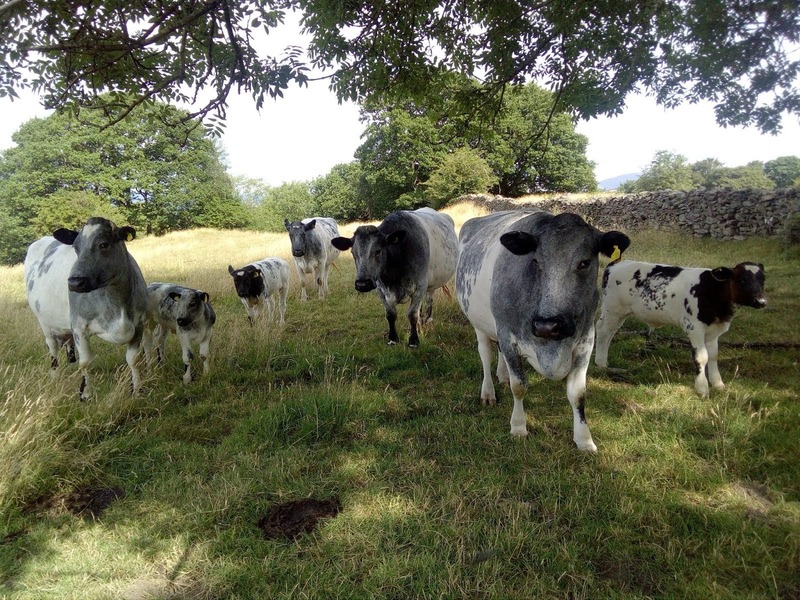 The farm covers fifty hectares of land which has traditionally been grazed by only a small number of cattle and supports some fantastic wildflower rich pastures, much of which has been designated as a Site of Special Scientific Interest (SSSI). Our first job was to get the straining posts into position. Usually this is done by hand and one person can generally dig in and tighten into position, two posts each day. As the fence line was so long and undulating, it meant there were a lot of straining posts to put in. Luckily, as the farm provided good access, we were able to speed the job along by getting a local contractor to come in with a tractor mounted post knocker and the whole lot were in place in less than a day. With the strainers in place, a single length of plain wire is attached between each post. This gives a straight line to help align the struts and fence posts. Struts are added to prevent the straining posts from moving while the wire is being tensioned. With these in place we then knocked in fence posts every two metres between the straining posts. Once all the struts and posts were in position it was time to attach the stock fencing. 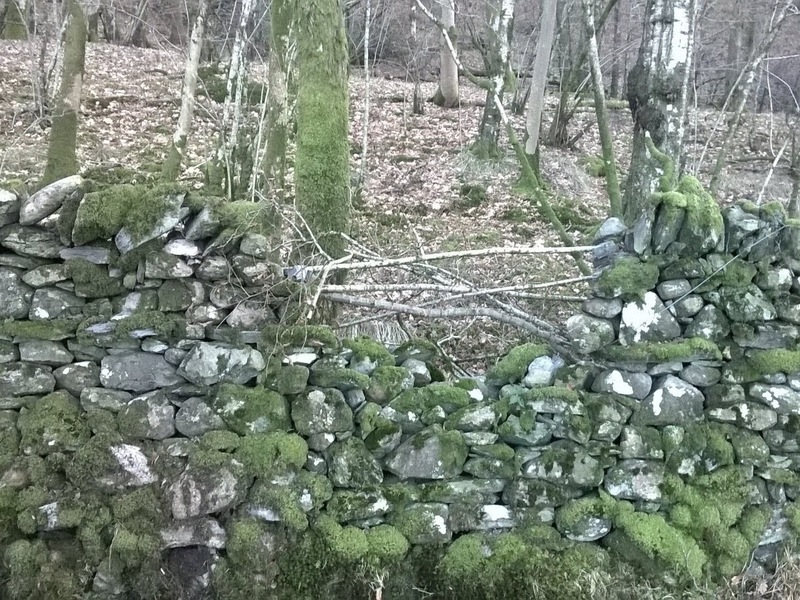 This is connected between straining posts and tightened to the required tension using two pairs of "monkey strainers". 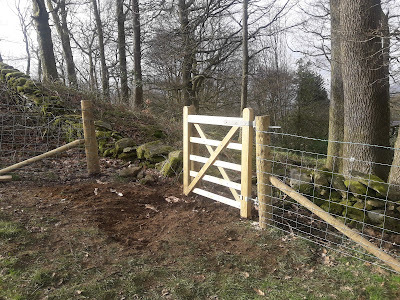 With all the stock fencing completed the next job was to add a single strand of barbed wire. 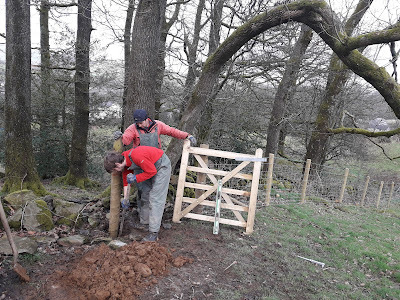 To make sure the fence was completely stock proof we added sections of post and rail fencing between straining posts and other boundaries such as dry stone walls or hedges (as shown in the photograph above). To finish off we incorporated a gate into the fence line to further improve access. 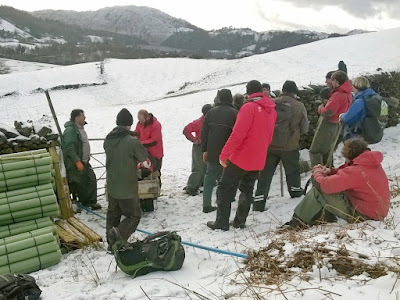 We recently had a site visit over to the bridleway coming down from Boredale Hause to check how things were looking and catch up with the South Lakes team, who are still working up there. This series of photographs shows how the path looked either prior to commencing work, or just after landscaping, and one month after the landscaping once the grass seed has started to grow. You can immediately see the difference now the grass has started to grow, as the eroded area has been considerably narrowed. 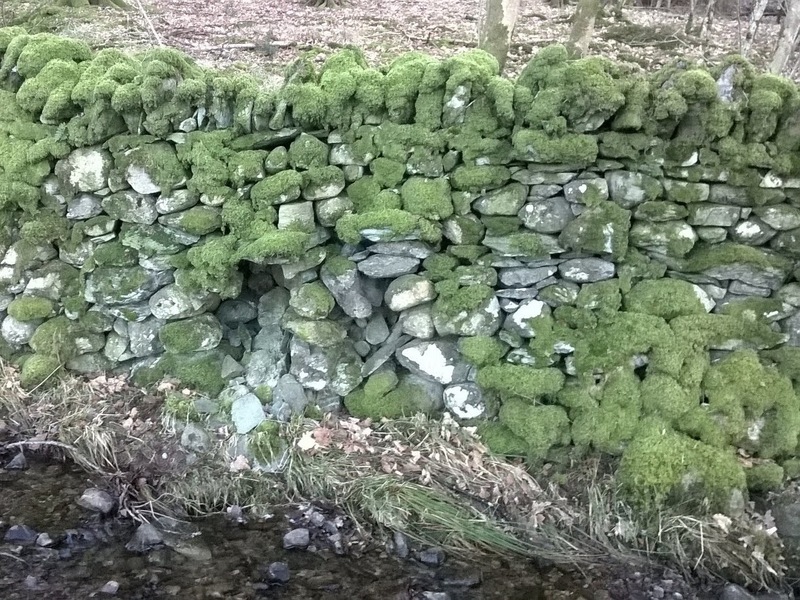 The erosion is wider in many places than can be seen in the photographs, as much of it is hidden by the piles of rock. It's still early days for the grass growth, as the banks are still very mobile and it can easily be set-back by sheep, dogs, or people walking over it. If the grass can be left undisturbed for a year, it is much more likely to withstand walking on. 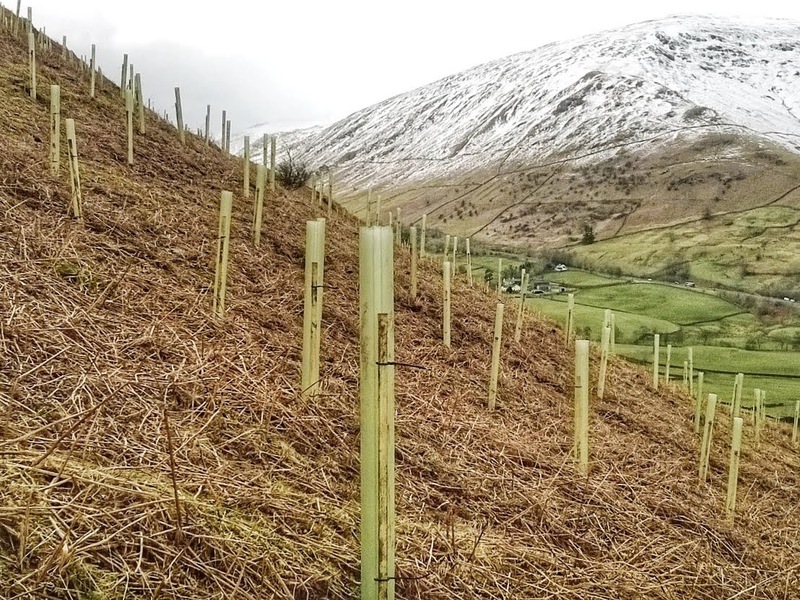 Sheep also have a tendency to be attracted to this fresh growth, but as it is just developing the sheep tend to pull the seedlings out by the roots as they are unable to cut through the grass with their teeth. This uprooted grass, of course, perishes. Most of the turf that was placed alongside the path, which had originally struggled due to the very dry summer, has now started to grow. 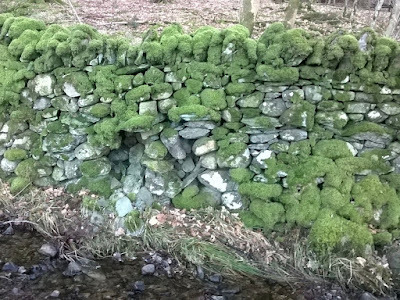 This will help keep much of the soil off the path if disturbed by sheep wandering over the banks. It can take time for everything to properly settle down and it's also likely that some of the grass will die off during the winter, so we'll keep a close eye on things and carry some more bags of grass seed up when required. We've been working on the path leading up to Boredale Hause for around three months now and although there's still a fair amount to do, it's really starting to take shape now. When working on a long length of path like this, we each work on a stretch of about ten metres at a time. When that section is completed and joined up with the team member working above, we leapfrog higher up the path and continue like this until the whole length of path is finished. You can see in the photo below how the full width of the erosion is used to help meander the path, making it easier to walk on and reducing the visual impact. Due to all the dry weather we've had this year, we've struggled getting grass seed to germinate on sections of path that we've landscaped and many of the turfs that were carefully removed while building the path have dried out and died. We've reseeded a couple of times and hopefully now that we're getting a few more showers, the grass will start to grow and cover the bare areas. As we've moved higher up the path, we've started to encounter more areas of bedrock. Most of this is just below the ground surface and can be removed with a crowbar or sledgehammer if it's in the way of the path. 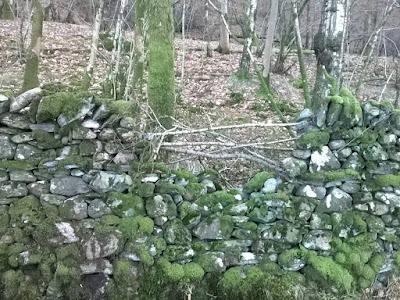 Dealing with bedrock adds an extra layer of complexity to the process of building a path, as well as substantially increasing the level of exertion required. One notable section was a large outcrop higher up the path. Generally, exposed bedrock like this is much harder and more difficult to break. Since bedrock becomes slippery when wet, many people try to avoid walking on it, which causes more erosion in the area... exposing more bedrock, etc, etc. So rather than stopping the path at the foot of the outcrop, we continued around it until a weaker section was found that could be chipped out to form the new path line. 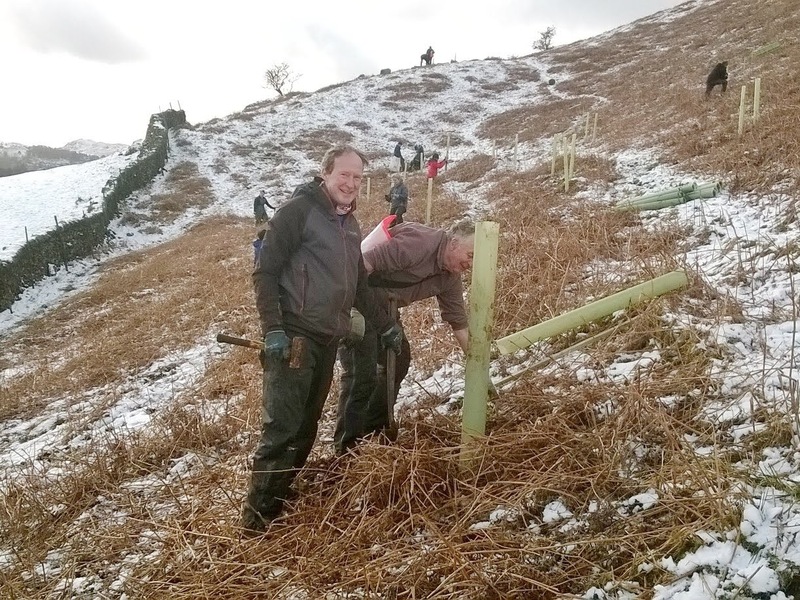 The new path line works really well and we're also leaving access to the exposed bedrock section alongside the path for the more adventurous mountain bikers to descend. 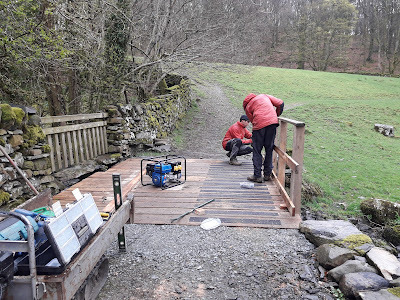 Since our last post we've spent a fair amount of our time working at Aira Force, on a section of footpath above High Cascades. 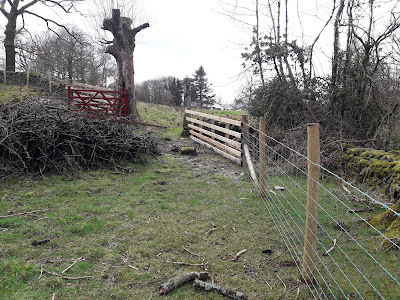 The section of path that we've been working on had previously been repaired many years ago, but as the path was a bit "rough and ready" visitors were avoiding it which had caused the area next to the path to become eroded. This can be seen in the photograph above. As the area is not very accessible, it was decided that some of the stone would be flown to site by helicopter. This was supplemented with useable stone from the original footpath and additional stone that we were able to gather from the surrounding area using our mechanical power barrow. To make the path blend in a little better, we adjusted the line to make it snake through the site rather than cut through in a straight line. The line was partially dictated by bedrock, which came to the surface at a couple of locations. To avoid having to chip away too much, we gave it a wide berth where possible. Our work was hampered on a couple of occasions by heavy snow which prevented us getting over to Ullswater or making it impossible to safely move large stones around. But on days with just a light scattering of snow we continued regardless. After a few weeks of work we had pretty much completed the stone path. The new path is much more user-friendly and incorporates a couple of large stone drains to shed water away and prevent damage. Unfortunately, due to the pressing job of gathering stone for our upland repairs, we weren't able to complete all the landscaping work in time. So we're hoping to get a bit of time later on in the year to tidy away some of the leftover rock and reseed the area and then the new path will be looking better than ever.